Menopause is the time when periods cease altogether. Perimenopause is the number of years before that, and can involve some missed periods. Menopause happens for most people around the age of 50, so Perimenopause generally happens in someone’s 40s. Learn more about the stages of menopause here. What about Periods in Perimenopause? During this phase of a person’s life, periods can get all crazy. This is usually due to changing hormone levels. And of course, you can also begin to miss periods. More details about Perimenopause missed periods in the next section, so keep on reading! It’s actually one of the common menopause myths that you have normal periods, which suddenly stop. Learn more here: Facts and Myths about Menopause. In very early menopause, you may have a change in experiences. For example, you could start to get hot flashes, increasing cramps, or insomnia. This can last for 2-5 years. During the early menopause transition, you will start to have irregular periods. Your cycle can start to vary in length by seven or more days. During the late menopause transition, you will start to skip periods. By “skipped periods,” we mean that there is 60 or more days between periods. When you begin to skip periods, your ovaries don’t release an egg that month. This early-late menopause transition takes around three years on average. Finally, once you start to miss more periods, you’ve entered into late Perimenopause. After a year of no periods? You’ve officially hit Menopause. 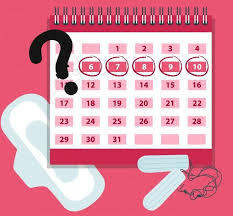 Should I Track my Period? It can be really useful information for your doctor to have a record of your menstrual cycle. It can also give you some peace of mind. Any excessive cramps, hot flashes, etc. Find out more here: How and Why to Track your Menstrual Cycle. Perimenopause Skipped Periods: Any Other Causes? The main reason for skipped periods during perimenpause is that you’re getting getting close to menopause. However, there are certainly other reasons for skipping periods that don’t involve this. It’s officially called Amenorrhea. The main reason for Amenorrhea is pregnancy. If you see your doctor about a missed period, this is the first thing they’ll check on. Can I actually get pregnant during perimenopause? It is indeed possible, as long as you’re still having a period so be sure to use protection if this is not what you want. Other, there are many more reasons for this. Quick note: there can be some very serious reasons for why you’re missing your period. Please see your doctor for a check-up if you start to have changes to your menstrual cycle. Am I Pregnant, or is it Perimenopause? For real. You’ve started to miss some periods and you’re in Perimenopause. Are you pregnant, or is it just a natural part of getting older? Our best piece of advice is to check with your doctor if you’re in doubt about Perimenopause missed periods. Beyond that, here are a few things you can look for. Infrequent Periods, but not in Perimenopause? If you have a long length of time between periods, or just skip periods altogether, you probably want to know why! You may also want to know about treatment options. What are some other Signs of Perimenopause? You can learn about them here: What are the Signs of Perimenopause? If you’re starting to miss periods, a natural question is when you’ll hit menopause. Officially, you’re in menopause when you haven’t had a period for one year. For most people, it occurs in the early 50’s. What age you go through menopause depends on a number of factors, but the most important one is genetics. Ask your Mom when she went through it. You probably won’t be too far off from that. However, there are some people who go through menopause in their 20’s or 30’s. This is usually due to some underlying medical condition. Perimenonpause Missed Periods: Have your Say! How old were you when you started to miss periods during Perimenopause? Leave a comment below and let us know.